Certification in Natural Remedies - Remnant Institute Inc.
You may have used natural healing methods sometime in your life, or perhaps you’ve heard its interesting effect in treating broad range of illnesses. You might be tired of the sophisticated conventional methods and got amazed with the simplest natural methods that give huge beneficial healing effect. Natural medicine has been established in the Garden of Eden where nature is the only cure. The use of herbs, water, and sunlight exist even before the first book in earth’s history was written. But as knowledge increase, modernization of health care has innovated, and with this advancement, the original method of healing became just a mere shadow that we can barely see. And as the conventional way of healing seem to show insufficient outcome, the use of natural medicine has gained popularity again, but this time more defined and scientific that offers not just cure but HEALING. In our generation, the field of Natural medicine became the option for those who are drawn to a health care system that speaks to the unmet medical needs of people. Health care is moving towards integration of conventional and alternative medicine, this, is so far the most effective way of providing complete healing. As you read on this message, we presume you’re seriously considering the study of Naturopathy to help others in a professional capacity. It takes long hours of study, high ethical standards and willingness to develop your own skills. You will be trained to treat the whole person, find and treat the cause, promote wellness, work with the healing power of nature and you will be trained to teach. But most importantly, you will be helping patients to create their own path to health, and witness the benefit of achieving Optimal Health. We hope that you will choose the NATUROPATHY program at Remnant Institute Inc., and become the health promoter that you can be. WELCOME! In the Philippines the practice of Traditional and Alternative Medicine is widely advocated and currently accelerating as it is being utilized autonomously and integrated with the practice of conventional medicine. The government has created the Republic Act 8423, which describes the goal of achieving acceleration in the development of traditional and alternative health care in our country. Remnant Institute Inc. is a Non Government Organization with a Security and Exchange Commission registration number CN200412032, affiliated with the Department of Health, Agricultural Training Institute and Medicina Alternativa International Institute, Technical and Educational Skills Development Authority and the Department of Social Welfare Development. Remnant Institute Inc. aims to promote knowledge on Natural Primary Health Care modalities and health empowerment, which are accessible, economical, and effective community based health services. Remnant Institute Inc. seeks to make Natural Primary Health Care methods an immense contribution to a global effort of bringing wholistic health into the hands of the people. Founded upon a wholistic philosophy, the practice of NATUROPATHY combines safe and effective traditional therapies with the most current advances in modern medicine. Naturopathy is appropriate for primary management of a broad range of health conditions affecting people of all ages. Naturopathy practitioners should be very highly trained professionals in the broadest scope of scientifically studied natural medicine modalities which are proven to promote health and healing. 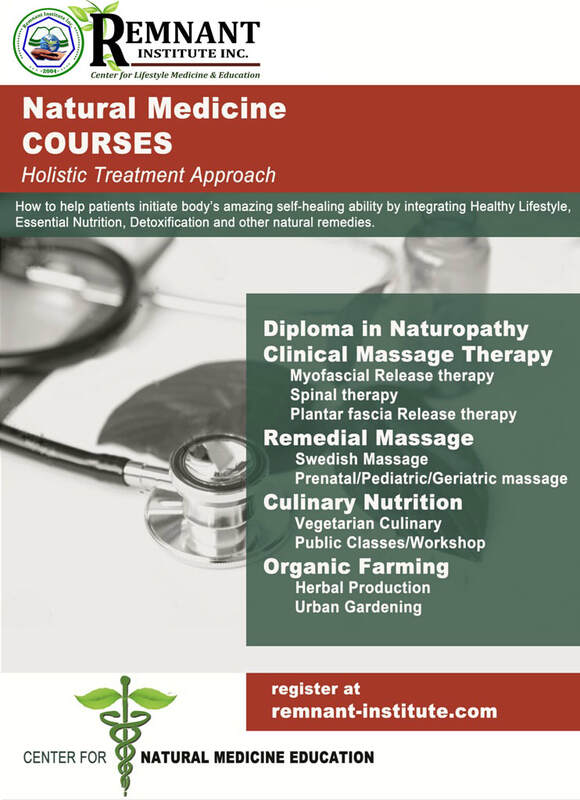 In addition to subjects on basic medical sciences and conventional diagnostics, natural medicine education includes therapeutic nutrition, botanical medicine, hydrotherapy, manipulative therapy, pharmacology and biochemistry. Naturopathy is a distinct system branching from primary health care. It is a diverse art, science and philosophy consisting careful practice of diagnosis, treatment and prevention of illness. Naturopathy is distinguished by the principles based upon the intellectual observation of the nature of health and disease, which are repeatedly examined in line of scientific advances. Methods used are consistent with nature’s principles and are applied based on patient’s individuality.